Your attention is particularly drawn to the provisions of clause 15. These Terms will apply to any contract between us for the sale of Products to you (Contract). Please read these Terms carefully and make sure that you understand them, before ordering any Products from our website. Please note that before placing an order you will be asked to agree to these Terms. Please click on the button marked "I Accept" at the end of these Terms if you accept them. If you refuse to accept these Terms, you will not be able to order any Products from our website. We amend these Terms from time to time as set out in clause 8. Every time you wish to order Products, please check these Terms to ensure you understand the terms which will apply at that time. These Terms were most recently updated on 4th May 2018. 1.1 We operate the website www.th2studio.co.uk. We are th2studio Ltd, a company registered in England and Wales under company number 09314463 and with our registered office at 214 Design Centre East, Chelsea Harbour, SW10 OXF. 1.2 To contact us, please see our Contact Us page. Our office hours are 9am to 5.30pm, Monday to Friday. 2.1 The images of the Products on our website are for illustrative purposes only. Although we have made every effort to display the colours accurately, we cannot guarantee that your computer's display of the colours accurately reflect the colour of the Products. Your Products may vary slightly from those images. 2.2 Although we have made every effort to be as accurate as possible, because some of our Products are handmade, all sizes, weights, capacities, dimensions and measurements indicated on our website have a 2% tolerance. 2.3 There may be some slight variation in colour between different batches of material used in, or different finishes applied to the exterior of, our Products. We hope you appreciate this as a sign of the quality and craftsmanship that has gone into the making of our Products. 2.4 All Products shown on our website are subject to availability. We will inform you by e-mail as soon as possible if the Product(s) you have ordered are not available and we will not process your order if made. 2.5 We are continually developing our products and reserve the right to amend the specification of Products without prior notice in relation to future sales. Your use of our website is governed by our Terms of Website Use and Website Acceptable Use Policy. Please take the time to read these, as they include important terms, which apply to you. 5.1 If you are a consumer, you may only purchase Products from our website if you are at least 18 years old. 5.2 As a consumer, you have legal rights in relation to Products that are faulty or not as described. Nothing in these Terms will affect these legal rights. 6.1 If you are not a consumer, you confirm that you have authority to bind any business on whose behalf you use our website to purchase Products. 7.1 For the steps you need to take to place an order on our website, please see our How it works page and take special note of our instructions on Measuring up your space for the Products you wish to order. 7.3 After you place an order, you will receive an e-mail from us acknowledging that we have received your order (Order Acknowledgement). However, please note that this does not mean that your order has been accepted. Our acceptance of your order will take place as described in clause 7.4. 7.4 We will confirm our acceptance to you within 24 hours of sending the Order Acknowledgement by sending you an e-mail that confirms that the Products are in stock and an estimated date for when they will be dispatched (Order Confirmation). The Contract between us will only be formed when we send you the Order Confirmation. If you do not receive an Order Confirmation please contact us on hello@th2studio.co.uk as we do reserve the right not to accept all orders. 7.5 If we are unable to supply you with a Product, for example because that Product is not in stock or no longer available or because of an error in the price on our website as referred to in clause 12.5, we will inform you of this by e-mail and we will not process your order. If you have already paid for the Products, we will refund you the full amount as soon as possible. (c) Other changes we may require from time to time. (d) In all other cases (if we are not at fault and there is no right to change your mind), see clause 9.4. 9.3 Exercising your right to change your mind (Consumer Contracts Regulations 2013). For most Products bought online, you have a legal right to change your mind within 14 calendar days of placing an order and receive a refund. 9.5 How long do I have to change my mind? How long you have depends on what you have ordered and how it is delivered. If you have bought Products, you have 14 days after the day you (or someone you nominate) receives the Products, unless Your Products are split into several deliveries over different days. In this case you have until 14 days after the day you (or someone you nominate) receive the last delivery to change your mind about the Products. 9.6 Ending the contract where we are not at fault and there is no right to change your mind. If you do not have any other rights to end the Contract (see clause 9.1), you can still contact us before it is completed and tell us you want to end it. If you do this the Contract will end immediately and we will refund any sums paid by you for Products not provided but we may deduct from that refund (or, if you have not made an advance payment, charge you) compensation for the net costs we will incur as a result of your ending the Contract. 9.7 To cancel a Contract or process a return, please give us notice in writing by sending an e-mail to hello@th2studio.co.uk to tell us. You may wish to keep a copy of your cancellation notification email for your own records. Your cancellation or return request is effective from the date you sent us the e-mail or posted the letter to us. (a) If you are cancelling the Contract, you will receive a full refund of the price you paid for the Products and any applicable delivery charges you paid for delivery by us of the Products to you. We will process the refund due to you as soon as possible and, in any case, within 14 calendar days of the day on which we receive the Products back from you. If you returned the Products to us because they were faulty or misdescribed, please see clause 9.8 (b). (b) If you have returned the Products to us because, following your inspection of them on delivery (see clause 10.7), they are faulty or misdescribed, we will refund the price of a defective Product in full, including any applicable delivery charges, and any reasonable costs you incur in returning the item to us. (c) If you have returned the Products to us because they are the wrong size for your space, and this results from mistakes made by you in measuring your space, or for any other reason, then we will refund the price of the Product but not any delivery charges and you will be charged a re-stocking fee of £45 and any collection charges (see 9.10(b) below). (d) If you are returning the Products for any other reason, we will refund the price of the Product to you, less any delivery charges and will charge you for the cost of collection (see 9.10(b) below). 9.9 We will refund you on the credit card or debit card used by you to pay. (b) Unless the Products are faulty or not as described (in this case, see clause 9.8), you will be responsible for the cost of us collecting the Products from you. 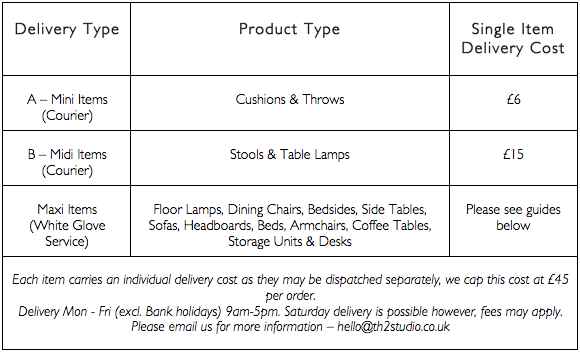 The cost of collecting the Products is set out in the table below. You have a legal obligation to keep the Products in your possession and to take reasonable care of the Products while they are in your possession, including keeping them in a safe place in their original packaging and not using them for any purpose. (d) Products bought at a discounted price, a trade discount or during a sale (unless they are faulty or significantly different to their description on our website). (a) As a trade customer, you will not be able to return any bespoke Products or Products bought at a discount. 11.1 We will contact you with an estimated delivery date. Many of our Products are made to order and the lead-time is between 6-10 weeks. Occasionally an Event Outside Our Control may affect our delivery to you. See clause 17 for our responsibilities when this happens. 11.2 You shall make all arrangements necessary to take delivery of the Products (including ensuring that the Delivery Address is clean and ready for installation of the Products to our satisfaction) for whenever they are tendered for delivery. 11.3 Delivery will be completed when we deliver the Products to the address you gave us. 11.4 You will receive a reminder before delivery, either from us or from our delivery company. If no one is available at your address to take delivery, we will leave you a note that the Products have been returned to our premises, in which case, please contact us to rearrange delivery. We will have to charge you the price of a re-delivery (the initial delivery cost that was charged). 11.5 Delivery will take place between the hours of 9.00am and 5.00pm from Monday through to Friday; please ensure that someone is available at your address to receive the Products at the agreed time. 11.6 If for any reason the delivery date is delayed by you, we shall charge you our reasonable storage and insurance costs for the Products until such time as the Products have been delivered to you. If the delivery date is delayed by more than 1 month, we may demand (and send an invoice for) full payment of the price of storage and insurance for such Products, and any other sums due under the Agreement. 11.7 It is your responsibility to advise us at the time of ordering of any non-standard delivery circumstances that may apply. In the event that you have not so advised us and we are unable to complete a delivery because of access constraints either to or in the building, a £45 restocking fee will be charged to you. 11.8 You own the Products once we have received payment in full, including all applicable delivery charges. We shall be responsible for storage and insurance of the Products on your behalf until delivery. The Products will be your responsibility from the completion of delivery. 11.9 Please inspect the Products on delivery. If you find they are faulty or misdescribed, then please highlight any problems to the delivery carrier or us as soon as possible via email to hello@th2studio.co.uk. We will refund the price of the Products to you provided that you have kept them in good and ‘saleable’ condition, in their original packaging and in a safe place prior to our collecting them from you (see clause 9.11). Please note that any mattress must be kept in its original sealed packaging to be returned and if this is opened then you will not be able to return the mattress. 11.10 We will not be liable for direct or indirect loss of profits or other financial loss or damage suffered by you as a result of any reasonable delay or delay due to any reasonable rescheduling of delivery. (b) Our delivery company will be in touch with you in the week preceding your delivery to arrange a delivery time, within reason. (c) We base our Man & Van delivery rates on the location of the delivery and the day of delivery. (e) We will provide you with the tracking information once the item has been shipped via email. (f) We will ship to any destination within the mainland UK. (g) If you have any questions regarding overseas delivery please get in touch and we will endeavour to assist. 11.13 Unfortunately, we only deliver to addresses on the mainland in the UK. 11.14 You may place an order for Products from one of the islands off the UK or from outside the UK, but this order must be for delivery to an address in the UK mainland. 11.15 If items are going to be exported then the liability and responsibility passes to the consumer on delivery of goods. We will not be liable for any return shipping costs, in any circumstance if the items are taken outside of the mainland UK. 12.1 The prices of the Products will be as quoted on our website from time to time. We take all reasonable care to ensure that the prices of Products are correct at the time when the relevant information was entered onto the system. However, if we discover an error in the price of Product(s) you ordered, please see clause 12.5 for what happens in this event. 12.5 Our website contains a large number of Products. It is always possible that, despite our reasonable efforts, some of the Products on our website may be incorrectly priced. If we discover an error in the price of the Products you have ordered we will contact you to inform you of this error and we will give you the option of continuing to purchase the Product at the correct price or cancelling your order. We will not process your order until we have your instructions. If we are unable to contact you using the contact details you provided during the order process, we will treat the order as cancelled and notify you by email. Please note that if the pricing error is obvious and unmistakeable and could have reasonably been recognised by you as a mispricing, we do not have to provide the Products to you at the incorrect (lower) price. 13.2 Payment for the Products and all applicable delivery charges is in advance, at the time you make an order. 14.1 For Products which do not have a manufacturer's guarantee, we guarantee that on delivery and for a period of six months from delivery, the Products shall be free from material defects. However, this guarantee does not apply in the circumstances described in clause 14.2. 14.4 Where the Products approved by you as part of the Contract between us have been ordered or supplied and are no longer required by you after the cancellation period has expired, we cannot guarantee our ability to accept a return or offer any level of refund. 15.1 We only supply the Products for internal use by your business, and you agree not to use the Product for any re-sale purposes, unless we have agreed in writing otherwise. 15.4 Subject to clause 15.2 and clause 15.3 , our total liability to you in respect of all other losses arising under or in connection with the Contract, whether in contract, tort (including negligence), breach of statutory duty, or otherwise, shall in no circumstances exceed the price of the Products. 15.5 Except as expressly stated in these Terms, we do not give any representation, warranties or undertakings in relation to the Products. Any representation, condition or warranty which might be implied or incorporated into these Terms by statute, common law or otherwise is excluded to the fullest extent permitted by law. In particular, we will not be responsible for ensuring that the Products are suitable for your purposes. 16.1 If we fail to comply with these Terms, we are responsible for loss or damage you suffer that is a foreseeable result of our breach of these Terms or our negligence, but we are not responsible for any loss or damage that is not foreseeable. Loss or damage is foreseeable if it was an obvious consequence of our breach or if it was contemplated by you and us at the time we entered into the Contract. 16.2 We are not responsible for the acts, omissions or conduct of any third party supplier engaged by us, including any failure by a third party supplier to meet any timetable specified. 16.3 We only supply the Products for domestic and private use. You agree not to use the product for any commercial, business or re-sale purposes, and we have no liability to you for any loss of profit, loss of business, business interruption, or loss of business opportunity. 16.5 We will not be liable for any damage arising out of defective, damaged or wrongly delivered Products, over and above the value of the Products themselves. 17.2 An Event Outside Our Control means any act or event beyond our reasonable control, including without limitation strikes, lock-outs or other industrial action by third parties, civil commotion, riot, invasion, terrorist attack or threat of terrorist attack, war (whether declared or not) or threat or preparation for war, fire, explosion, storm, flood, earthquake, subsidence, epidemic or other natural disaster, or failure of public or private telecommunications networks (including internet servers and broadband providers) or impossibility of the use of railways, shipping, aircraft, motor transport or other means of public or private transport. (c) We will not be liable for direct or indirect loss of profits or other financial loss or damage suffered by you as a result of any delay due to an Event Outside Our Control. 18.1 When we refer, in these Terms, to "in writing", this will include e-mail. (a) To cancel a Contract in accordance with your legal right to do so as set out in clause 9, you must contact us in writing by sending an e-mail to hello@th2studio.co.uk by sending a letter to 214 Design Centre East, Chelsea Harbour, London SW10 OXF . You may wish to keep a copy of your cancellation notification for your own records. If you send us your cancellation notice by e-mail or by post, then your cancellation is effective from the date you sent us the e-mail or posted the letter to us. (b) If you wish to contact us in writing for any other reason, you can send this to us by e-mail (as in 18.2) or by pre-paid post to th2studio at 214 Design Centre East, Chelsea Harbour, London SW10 OXF. You can always contact us using our Customer Services telephone line (0207 349 1289). 18.3 If we have to contact you or give you notice in writing, we will do so by e-mail or by pre-paid post to the address you provide to us in your order. 18.4 If you are a business, please note that any notice given by you to us, or by us to you, will be deemed received and properly served immediately when posted on our website, 24 hours after an e-mail is sent, or three days after the date of posting of any letter. In proving the service of any notice, it will be sufficient to prove, in the case of a letter, that such letter was properly addressed, stamped and placed in the post and, in the case of an e-mail, that such e-mail was sent to the specified e-mail address of the addressee. The provisions of this clause shall not apply to the service of any proceedings or other documents in any legal action. 19.1 We may transfer our rights and obligations under a Contract to another organisation, but this will not affect your rights or our obligations under these Terms. We will always notify you by posting on this web page if this happens. 19.2 You may only transfer your rights or your obligations under these Terms to another person if we agree in writing. However if you are a consumer and you have purchased a Product as a gift, you may transfer the benefit of the warranty in clause 14 to the recipient of the gift without needing to ask our consent. 19.3 You shall not (except with our prior written consent) directly or indirectly solicit or entice away (or attempt to solicit or entice away) from our employment any person employed or engaged by us during the term of this Agreement or for a further period of 6 months after the termination of this Contract. If you commit a breach of this clause, you shall, on demand, pay to us a sum equal to six months’ basic salary or the annual fee that was payable by us to that employee, worker or independent contractor plus the recruitment costs incurred by us in replacing such person. 19.4 This Contract is between you and us. No other person shall have any rights to enforce any of its terms, whether under the Contracts (Rights of Third Parties Act) 1999 or otherwise. However, if you are a consumer, the recipient of your gift of a Product will have the benefit of our warranty at clause 14, but we and you will not need their consent to cancel or make any changes to these Terms. 19.5 Each of the paragraphs of these Terms operates separately. If any court or relevant authority decides that any of them are unlawful or unenforceable, the remaining paragraphs will remain in full force and effect. 19.6 If we fail to insist that you perform any of your obligations under these Terms, or if we do not enforce our rights against you, or if we delay in doing so, that will not mean that we have waived our rights against you and will not mean that you do not have to comply with those obligations. If we do waive a default by you, we will only do so in writing, and that will not mean that we will automatically waive any later default by you. 19.7 If you are a consumer, please note that these Terms are governed by English law. This means a Contract for the purchase of Products through our website and any dispute or claim arising out of or in connection with it will be governed by English law. You and we both agree that the courts of England and Wales will have non-exclusive jurisdiction. However, if you are a resident of Northern Ireland you may also bring proceedings in Northern Ireland, and if you are a resident of Scotland, you may also bring proceedings in Scotland. 19.8 If you are a business, these Terms are governed by English law. This means that a Contract, and any dispute or claim arising out of or in connection with it or its subject matter or formation (including non-contractual disputes or claims), will be governed by English law. We both agree to the exclusive jurisdiction of the courts of England and Wales.